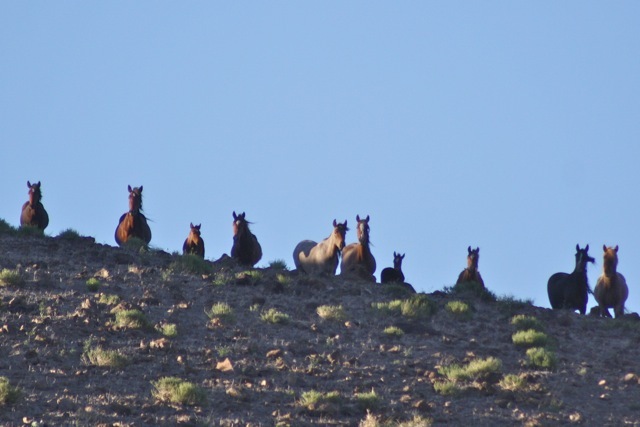 Will BLM change practices in the wild horse and burro program? Will there be an “out with the old” ways? EDITORIAL RESPONSE by WHE: A writer in Ely is taking a stand that ranchers need to charge the Bureau of Land Management (BLM) for wild horses drinking what he calls the “ranchers water.” This statement gives you a clear idea of how a “right” to use a resource, in the mind of a public land rancher, creates “ownership” of that resource for the rancher and ignores all other “rights.” This is becoming an increasing issue on public land as drought (the third year), and the potential of the sage grouse being listed as an endangered species, creates a “panic” mentality for public land ranchers. If you really know how things work in Nevada this kind of thing would be considered such an absurdity and ignored in a “sane universe.” However in the “alternate universe” the state and local governments are run by powerful ranching families (in spite of the current claims that Reid runs the state and is “anti rancher” because somehow he conspired twenty years ago to take Bundy’s ranch. If you think Nevada politics is “anti rancher” take a good long look at the State Legislature that tried to violate the state Constitution a few years back and deny wild horses water in the state). Ranchers are all running on the Cliven Bundy fiasco where BLM has appeared to cave in to illegal actions and the threats against wild horses by Iron County in Utah where again it appears BLM lacks backbone. However this is Nevada. Like it or not things ARE different here. WATER on public land is not the property of a rancher. Water is a “right” permitted by the state of Nevada. BLM applies for a right just like any other entity. Water is a “right” granted by the state for “available” water use. BLM gets a permit for “wildlife” (you idiots that want to make that word “wildlife” associated with a wild horse the next “fight,” you need to “step off your fictional soapbox and realize the LAW recognizes wild horses as a part of that granted right). A public land rancher is also given a permit for water use in an allotment (now please get it in your head that an allotment is NOT private property but public land). An allotment is granted and regulated by the FEDERAL government. The forage in the allotment has other legal uses besides a livestock PERMITTEE. The price for that forage is far below market rate. A permittee pays $1.35 for what would cost about $15.00 on the open market. This fee has not been raised in decades. Also public funds ARE used to develop water sources for livestock on public land (click the highlighted text at the beginning of this paragraph). In addition use by extractive industry creates an opportunity for BLM to do what it calls “mitigation” for impacts to other uses. We can think of half dozen examples where this “mitigation” was done to benefit public land grazers and not wild horses (in one example the created water source was placed a quarter mile outside an HMA, on HA land that was taken away from wild horses but still has cows and is public land, causing the wild horses that use that source to be called “off HMA” and unjustly picked on for the nonsense the government has turned the Wild Free Roaming Horses and Burros Act into to accommodate ranchers). The American tax payer (according to the Government Accounting Office or GAO) operates the federal grazing program at a loss to tax payers of over $123 million dollars. (2009 statistics). 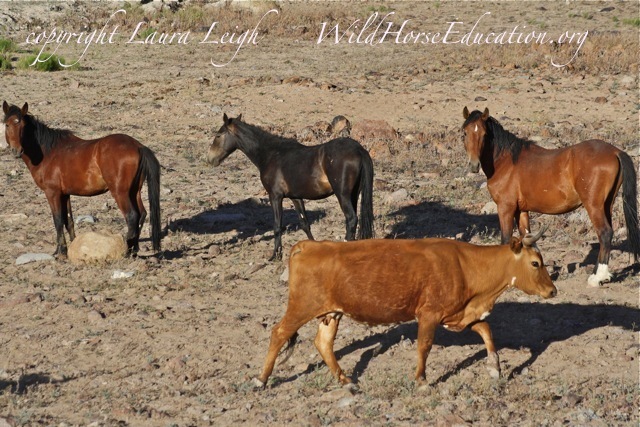 In that same year “The 2009 budget request for the Wild Horse and Burro program is $36,961,000.” So the wild horse and burro program costs almost a quarter of what the loss to the American tax payer is for private livestock use? So the American tax payer allows private profit to occur from the most destructive user of public grazing (domestic livestock) and basically does so at a cost that almost quadruples the cost of removing and warehousing wild horses also at tax payer expense? All to accommodate someone that can’t accept that grazing his livestock in a drought will destroy the range for possibly decades to come and expects to reap the same profit off of public land he did in non drought years while the rest of America suffers from an economy where foreclosure rates are through the roof? Give us a break. Congress it’s more than past time you raise grazing fees to match market rate and stop spoiling your “favorite” child on public land. That child has abused America’s generosity long enough. There is another point that is pertinent here about public land. Currently about 11% of public land is occupied by wild horses and over 66% is open to public land ranching. Only about 20% of public land ranchers (that receive that nice grazing fee) actually deal with wild horses in any fashion. Attacking wild horses is going to bring serious attention to the way in which livestock is subsidized on American public land. More than 80% of Americans are against horse slaughter and nearly that number favor wild horses on public land. Why would the other 80% of public land “welfare ranchers” allow this kind of pandering to continue? We have always advocated for equitable distribution of resource under law for wild horses and burros and respected the rights of others. Maybe it’s time we change our thinking? Maybe our interest on public land is the only real “right?” If we listen to the ranchers that is how we should be thinking. (The ranchers are the ones, btw, that created the “Appropriate Management Levels” that keep “our” right a minimal participant in public land policy). We have a right to speak our mind and pursue “life, liberty and justice.” Our forefathers fought for it. If we follow the “rancher built alternative universe theory” those rights are ours and ours alone. We should also be paid to do so by our government (or at least subsidized) in those pursuits. We expect a check in the mail. Are wild horses on the edge of becoming only a chapter in a history book? If “cooler” heads don’t step in soon that have a real recognition and respect for the law…. 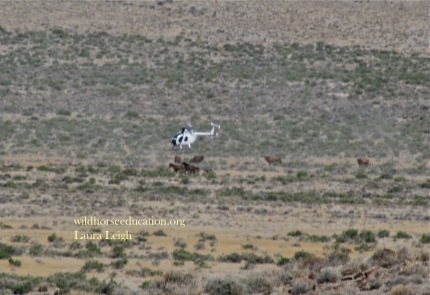 we will see a repeat of history and the outlook for our Western ranges and wild horses is not a good one. Another example of how the American Government is failing to keep its promises to the American public. Another example of OUR PAID officials not protecting WHAT THEY ARE PAID TO PROTECT! We the public need to DEMAND OUR MONIES RETURNED & OUR PROMISES KEPT! Public Lands Grazing is a PRIVELEGE not a RIGHT. It doesn’t matter in what terms it’s couched. Allotments are a ‘lease agreement’, not an inference of ownership, regardless of how long your family or ancestors have been suckin’ off that particular parcel. How would this apply if, say, a family had been renting the same apartment for the same rent for 30 years, then demanded that the smaller family next door gets kicked out because they use the same resources you do? Would you be within your ‘rights’ to demand the landlord give you a kickback or a discount simply because of your length of tenure? It’s no different, aside from a decades-old culture of entitlement, that Public Lands ‘Ranchers’ feel their land use is the only use worthy; they come just short of indicting wildlife because of the hunting lobbies, or a personal interest in ‘harvesting’ wildlife themselves. how about a doing a petition on Change.org? Worse then little children fighting over the last M&M. 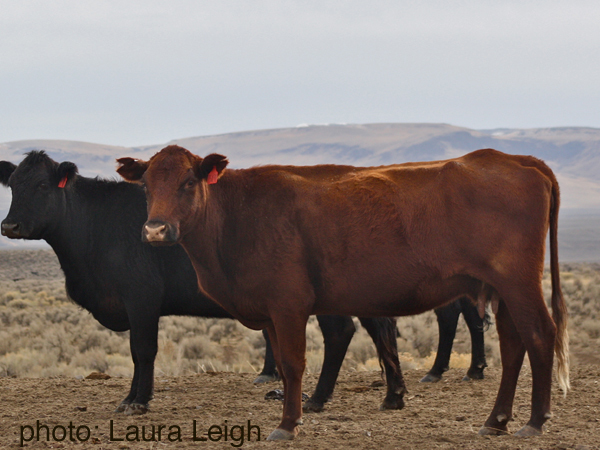 So few animal groups are taking the Public Lands Livestock Grazing issue seriously, so it is gratifying to know this group does. Since the 1880’s The Livestock Industry has run roughshod over these fragile lands, and the native wild animals that have called these lands home. Over the decades, this environmentally-destructive industry has been responsible for the torture and extermination of billions of native wildlife: coyotes, wolves, bears, birds of prey (& other bird species), bobcats, lynx, mountain lions, prairie dogs, wild horses–you name them–have been poisoned, shot on foot and by air,rounded up for slaughter, burned out of dens, trapped. Just so the Livestock Industry can make room for more cattle and sheep. Wilderness areas, National Forests, Wildlife “Refuges,” BLM lands & state lands are grazed to the bone and have become Domesticated Feed Lots for livestock. Native wild species, including plants and animals are in decline, along with precious water supplies, native grasses and productive soils. The Livestock Industry uses propaganda to lull the public into believing that grazing domesticated sheep and cows is actually just as good or better than what the native ungulates have done: thus, the new slick marketing of so-called “organic, grass-fed, sustainable and local” livestock products, which many unthinking people have accepted as Truth. The truth is that the Livestock Industry, globally, is a major contributor to the climate change , and to the release of the very volatile gas, methane, which exacerbates the environmental destruction. Native wildlife have existed on these public lands for thousands of years. These lands are their only hope for survival as climate change worsens. Yet, they are being driven out and exterminated because of the Livestock Industry on Public Lands, which is getting an almost-free financial ride to graze at below-market rates. This industry must be removed from All Public Lands if we want to save remaining native wildlife. What should these public lands be? Barren, lifeless Domesticated Feed Lots, or environmentally healthy lands where native wild animals can live in peace?